In 2016 Gayathri Mantra Japam is on Wednesday, 19 August, one day after the Yajur Upakarma or Avani Avittam on 18 Aug, and two days after the Rig Upakarma on 17 Aug. The Sama Upakarma is on 04 Sep 2016. But the Gayathri Japam is on the same day for all 3 vedis. Though it is usual practice to include the Gayathri Japa Sankalpam within that leaflet, as a paragraph, we choose not to do it. For long, we have been treating Gayathri Manthra Japam as an addendum of the Upakarma or Avani Avittam. In truth, Gayathri Mantra Japam is something special on its own. for Gayathri Japam here and here. A proper 108 Gayathri recital would take about 25 minutes and a 1008 recital upto 3.5 hours or more. The procedure given only details the Gayathri Mantra Japam, and does *not* include the procedure for Gayathri Japam as SamithaDhaan. That procedure is completely different. Do not confuse between the two. 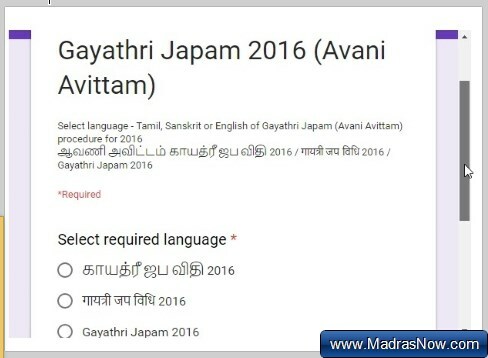 Now, we are happy to make available the Gayathri Japam 2016 procedure for Avani Avittam in Sanskrit and English scripts for those who cannot read Tamil. 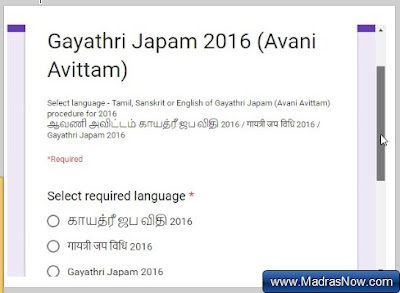 will open up a Google Form, where you can select either Tamil, Sanskrit or English languages. Or the same Google Form is appended below - you can use either. Select the language by clicking the relevant 'Radio'choice button > click on 'Next' > a section will open & display a goo.gl shortened download 'link' > click on the 'link'and the PDF file will open > download with the 'd/l button'or Çtrl+S' to save file. Last, do not forget to click 'Submit'button on the form, so we can track number of downloads. Thanks as always for your service. CAn you please share the google form link for 2016 yajur upakarma?